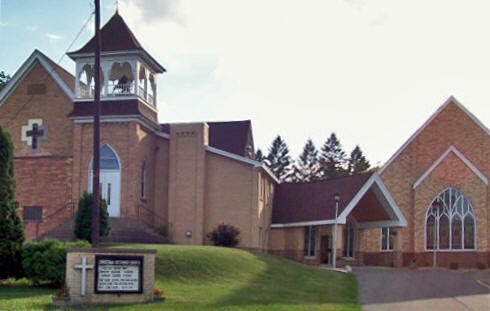 Do you have photos, historical accounts or other items pertaining to the Pease area? Would you like to share this historical information with the world? LakesnWoods.com would like to publish your Pease photos (current or historical) or historical accounts on this website. Original materials can be returned and your privacy will be respected. 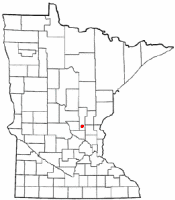 Pease is a city in Mille Lacs County, Minnesota located between Milaca and Princeton on U.S. Highway 169. 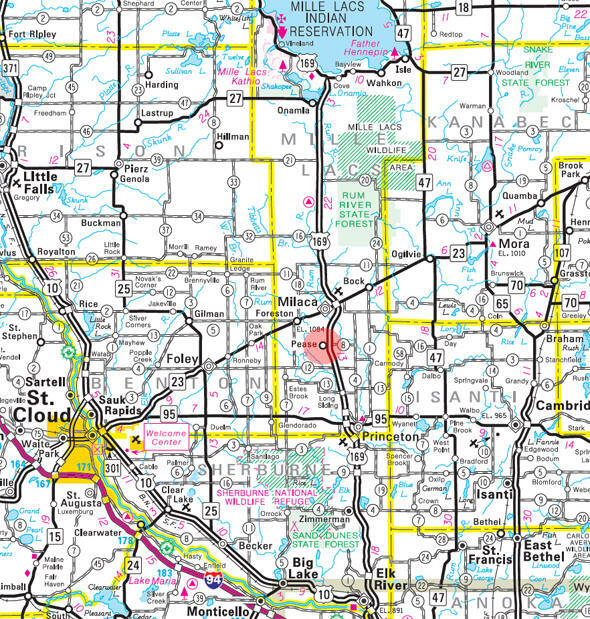 According to the United States Census Bureau, the city has a total area of 0.91 square miles (2.36 km2), all of it land. The elevation is 1,037 ft (316 m) above sea level. As of the census of 2010, there were 242 people, 86 households, and 63 families residing in the city. The population density was 265.9 inhabitants per square mile (102.7/km2). There were 93 housing units at an average density of 102.2 per square mile (39.5/km2). The racial makeup of the city was 97.9% White, 0.8% Asian, 0.8% from other races, and 0.4% from two or more races. Hispanic or Latino of any race were 1.7% of the population. There were 86 households of which 44.2% had children under the age of 18 living with them, 50.0% were married couples living together, 12.8% had a female householder with no husband present, 10.5% had a male householder with no wife present, and 26.7% were non-families. 19.8% of all households were made up of individuals and 5.8% had someone living alone who was 65 years of age or older. The average household size was 2.81 and the average family size was 3.11. The median age in the city was 29.3 years. 31.8% of residents were under the age of 18; 8.6% were between the ages of 18 and 24; 26.8% were from 25 to 44; 26.6% were from 45 to 64; and 6.2% were 65 years of age or older. The gender makeup of the city was 51.2% male and 48.8% female. 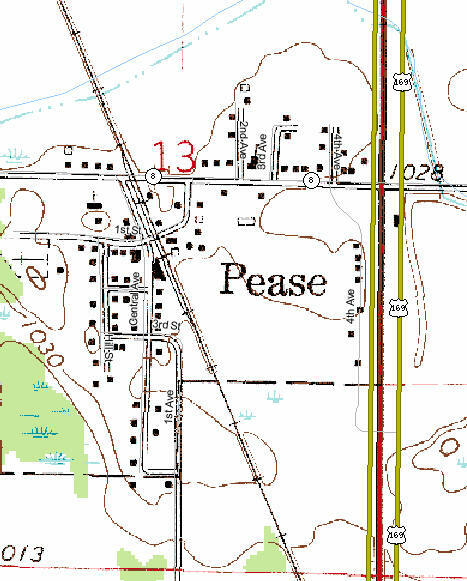 PEASE, a city in section 13, Milo, was incorporated as a village on August 6, 1923. In 1882 Benjamin Soule, a Maine lumberman, who had a sawmill at Princeton, built a second sawmill and a hotel two miles northeast of the present Pease called Soule's Crossing and located on the east branch of the Rum River; in 1886 when the railroad completed the tracks from Princeton to Milaca, Soule built another sawmill near the tracks, which was then called Soule Siding; following the Hinckley fire in 1894 that destroyed the sawmills, the first Dutch arrived at Soule Siding, settling on land around the Siding, and requested a post office, at which time the name was changed to Pease, either by the railroad for James J. Hill's friend Granville S. Pease of Anoka, or as a misspelling of Peace, the name requested by the residents. 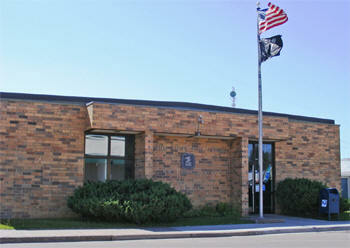 Post Office: A post office called Pease was established in 1894, and remained in operation until 1994. 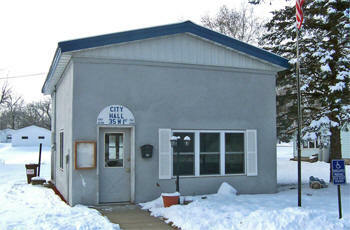 Pease is now served by the Milaca Post Office.